“You must have become very strong pushing that kart up all those hills.” You can’t imagine how many times I’ve heard that statement. Sorry, but no. I’ve read many articles stressing the importance of upper body exercise. Scooby Werkstatt is an online fitness guru whom I first found years ago via his website, scoobysworkshop.com. His videos are well-designed and fun. I had the pleasure of meeting Scooby in person at FitExpo in San Jose. He’s in his 50s, a body builder and sports enthusiast who does all his videos and appearances shirtless to show that even an “old guy” can look fantastic. He is also a wonderfully nice and generous person. The pull-up is a compound exercise that works your arms, back, and shoulders, including your lats, delts, biceps, triceps, pecs, abs, and core. Years ago when I was in my early 50s and felt (or observed) that my physical strength was quickly declining, I asked myself, “What’s a good indicator that I’m ‘in shape’”? The answer I came up with was pull-ups. I hadn’t done any in 40 years, and at the time I could not do even one. So I accepted the personal challenge, and set on a path that would, I feel, change my life. 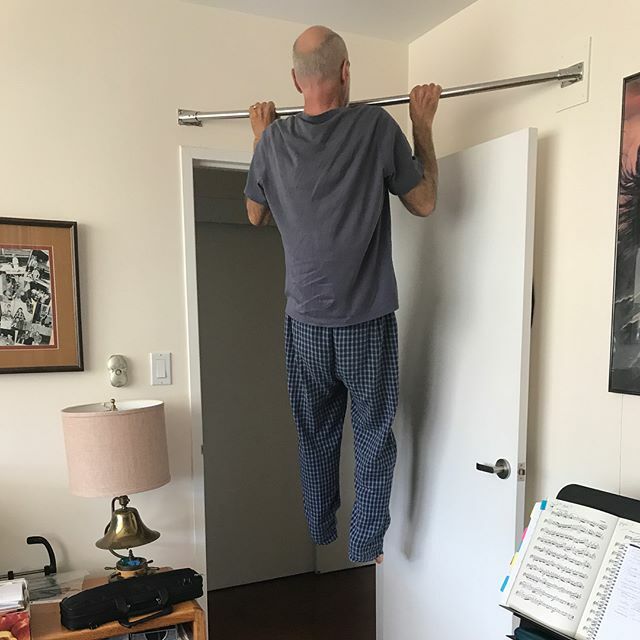 It took six months before I could do 10 consecutive pull-ups. By themselves, they do not make you look like Arnold. Or Scooby. They just make you strong. They also give you significant cred at the gym. I didn’t know this, because I don’t go to a gym. But at one point I found myself in the fitness room of a cruise ship, surrounded by some verybuff guys pumping a LOT of iron. Me, I just did the 5 sets of 10 pull-ups I always do, along with some pushups, squats, and planks. I didn’t lift a barbell or a dumbbell, or step on an exercise machine of any kind. As I was leaving, one of the body-builders came over to shake my hand. “I wish I could do pull-ups like that!” I thanked him, and had the wisdom not to ask why he couldn’t. It’s the same old thing: form vs. content. Far from being stronger from walking 15 to 25 miles a day pushing my kart, I actually lost some of my upper-body strength. I’m working on regaining it. We each seek cred where and how we can get it.